The diversity and the abundance of the assemblies of foraminifères planctoniques, of coccolithes indicate that the climate under which the chalk formed was of tropical type and that the temperature of waters of surface was of at least 20°C (to see Values of d18O). Ices did not recover (or then little) the poles. 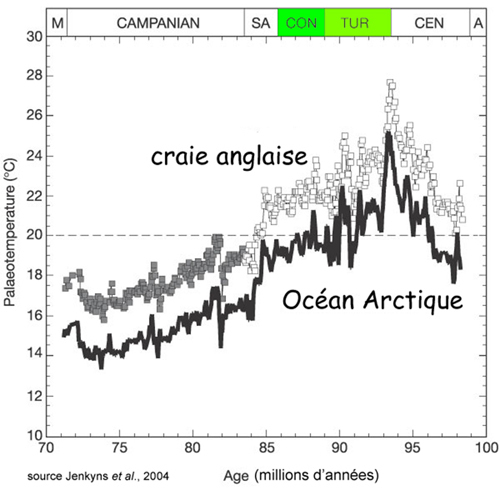 We sometimes speak about climate "in greenhouse effect" by evoking the Cretaceous. Cliffs, swamps and even dinosaurs could reach or exceed latitudes superior to 60 °. The composition of atmospheric gases was different, with in particular more O2 and of CO2 (from 1,5 to 8 times more CO2 than today, Fool, on 1994). 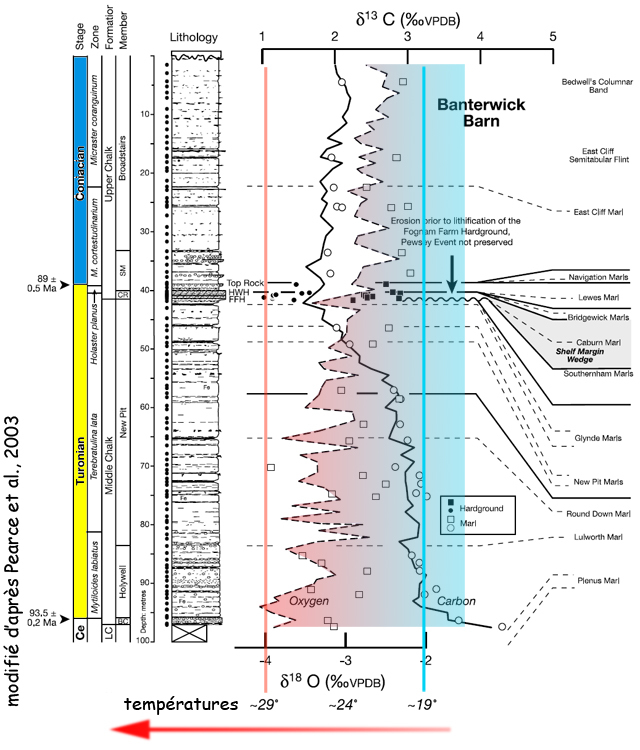 This graph (Jenkyns and al ., on 2004) shows the evolution of the temperatures of surface of the sea of the chalk, in the South of England, either in a paléolatitude about 40°N (corresponding to current Sardinia), or about ten degrees further south. Then, the temperatures are going to tend to decrease while remaining globally strong. In the deep, oceanic environments or of bank, mainly from the summit of Cénomanien and until Maastrichtien, marls or red, rich scaglie hématite and goethite finely spread, settle with a low rate of sedimentation. We call them CORBs (upper Cretaceous Red Beds). The Total Organic Carbon (OBSESSIVE-COMPULSIVE DISORDER) is very low (llower than 1 for one thousand) ) there. This CORBs would testify of the immersion towards the depths of cold waters of surface and as a consequence oxygenated well. We would so pass of episodes euxiniques (= rich in H2S) or OAEs (Oceanic Anoxic Events) in periods strongly oxyques longer or CORBs associated with a strong oceanic ventilation. The transition OAE / CORB, and vice versa, is rough, while the anoxic periods and oxiques can last of one in two million years. The causes of the OAEs are not clarified with certainty and are doubtless multiple. 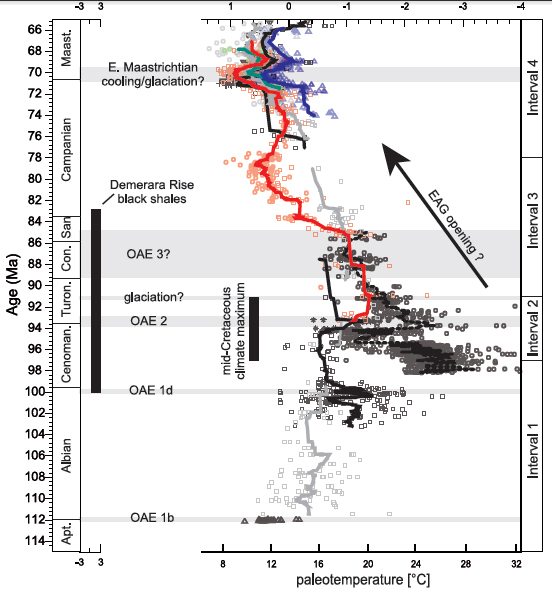 The most likely hypothesis is the dropping in the atmosphere of greenhouse gas maintained by the magmatisme and the tectonics. 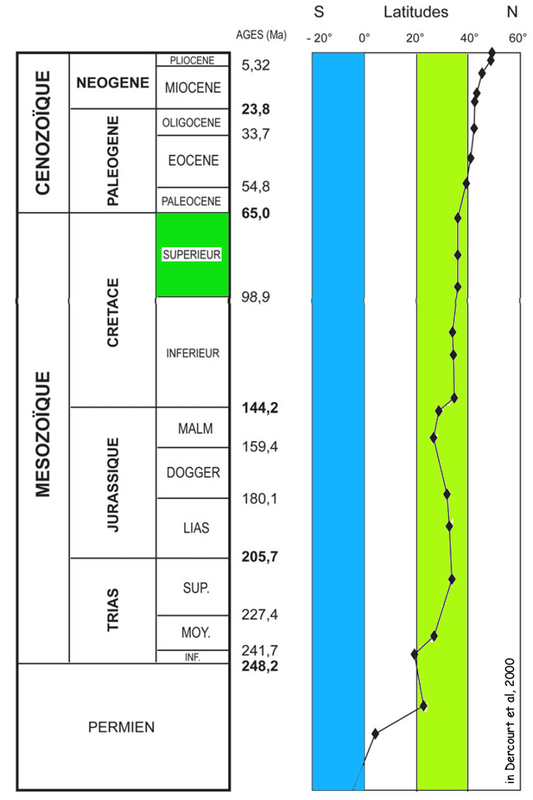 The sum of the effects of the LIPs (LLarge Igneous Provinces, as Ontong Java, Kerguelen, the Caribs and Madagascar) ) and BITS (MMid Oceanic Ridges) ) is particularly important during all the Cretaceous (CCoffin and al ., on 2006)). This phenomenon can be amplified by the massive injection of methane trapped in clathrates (cconsisted lens locking the methane). Assist phase with the zone to Subprionocyclus neptuni (90,1 - 89,7 My) corresponding to the hardground Hitchwood, at the top of Chalk Rock. A positive peak of d18O raised on a carrot drilled on Demerara Rise (the equatorial Atlantic Ocean off Guyana) leads Bornemann and al. (2008) to propose an episode of glaciation. This one is situated at the top of average Turonien, on the verge of zones CC11 and CC12, put in equivalence with the event Pewsey de Jarvis and al. (2006). Let us remind that this event takes place between marls Glynde and marl Southerham.